Designing learning content, whether instructor-led or through elearning rarely follows a linear process. The beginning stages might be more direct as you define the learning goals, objectives and expected outcomes, however once the content creation phase begins, the process quickly transforms into one of agile development. Effective project management skills are essential to ensure the successful implemention of a new training module or a revamp of existing training content. It all starts with a well thought out project plan. 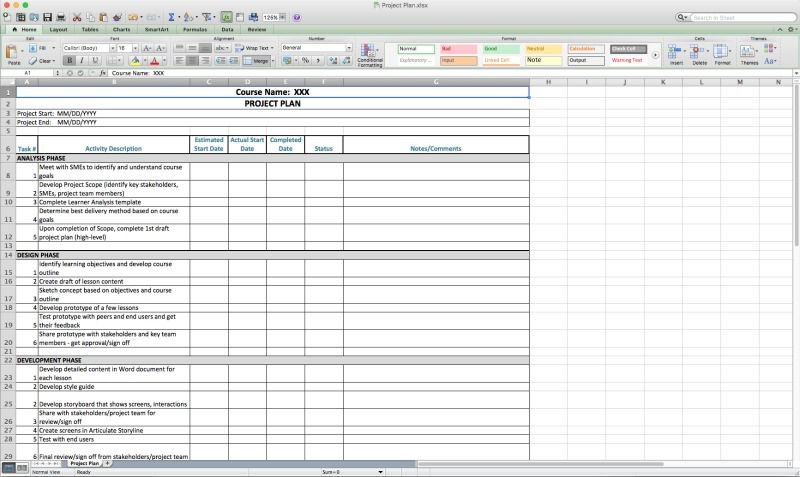 Here is an example of a project plan template that I have created and use in all projects that I manage. This project plan is created in Excel and is set up based on the ADDIE model, but the reality is when managing an elearning project, it will probably follow an agile or blended approach.